Just a quick reminder that the House Mouse and Friends Monday Challenge is at the Mid-Way point. It's challenge # 140 and the theme is Ribbons and Pearls. We have FOUR fabulous sponsors for this challenge, two $25 gift vouchers and two $ 10 gift vouchers. All the details are on the House Mouse and Friends Monday Challenge blog. Hope you can join us. Love to see what you come up with. Good morning. Just catching up on all the goodies I have missed lately. You have been pretty busy, my talented friend. I love the different shapes of cards you have created. You always seem to come up with interesting cards. Trying to pick my favorite and ummmm.. It's between the bunny sitting in the egg and this House Mouse. ooooo what a gorgous card Sue. these image is so nice...I like the humour. your card in the previous post is also beautiful made whith the chickens. 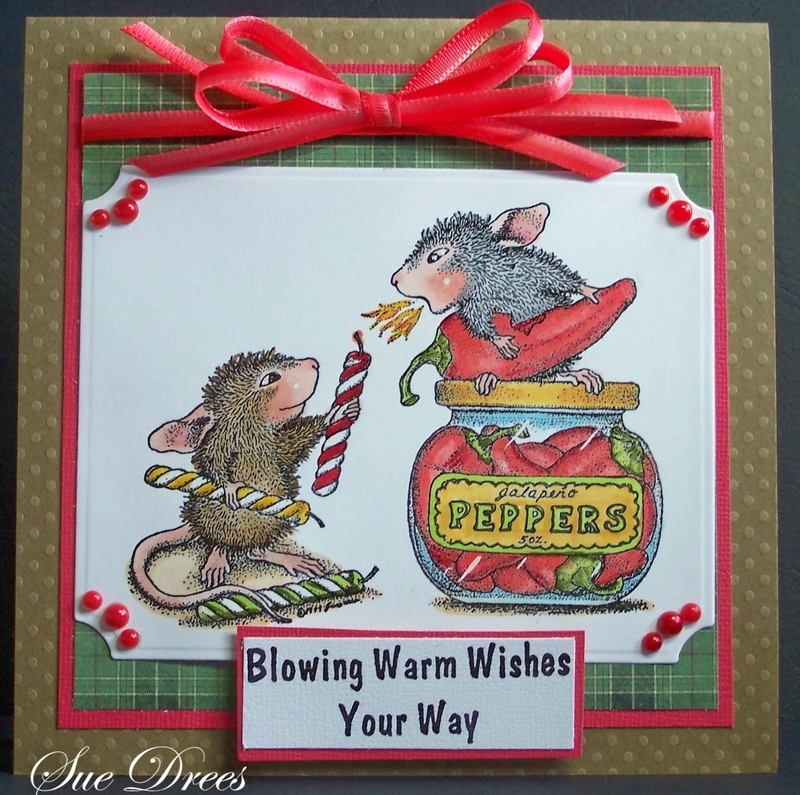 Hi Sue, love the house mouse image and your lovely bow and red pearls. Terrific card! Gorgeous card Sue, I love your colour scheme and fabulous design. Your beautifully colour image is adorable and fantastic details!!! I love this image...so colorful and fun! Those fun corners with the added pearls is a great touch too! A fab and fun creation, love the stamp and layout too. You made me smile, Sue, with this cute image and sentiment. Such a lovely card.